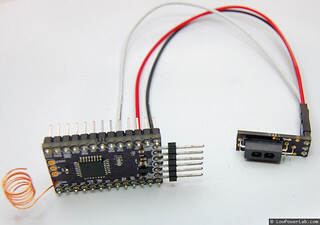 EE-SY310 photo reflective sensor breakout board with Moteino wireless node. This sensor can be used to read a water meter or even analog electic meter dial (that has a black stripe on it). It is a DARK-ON sensor, it outputs a digital HIGH when it detects a light-dark transition.